Angel Rattles Discounts Apply ! 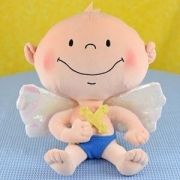 Big Angel Baby Rattles are delightfully cute. Perfect for new baby gifts, baptism gifts, and baby shower centerpieces. Finished size is approximately 14" high, and 11" ear to ear.